Tuesday • October 23 • 2012 Volume 79 • Number 43 INSIDE: Presorted Standard US Postage Paid Permit #8 ECRWSS Vermillion, SD Bomgaars ? Sears ? Menards ? Employment ? Dining ? One In A VerMillion ? bp Broadcaster Press Postal Patron Local Since 1934 201 W. Cherry ? Vermillion, SD 57069 ? Phone: 605-624-4429 ? Fax: 605-624-2696 ? www.broadcasteronline.com A hunter has to trust their gear at the moment of truth... A Great Hunt Begins With Us! Carry Lite EZ Buck Deer Decoy Beaver Tail Comfort Zone Field Blind 260.99 $ 99.99 $ 169.00 $ Danner Pronghorn GTX Therma Cell Heated Insoles •Waterproof •Breathable •Thinsulate •200 grams Wireless Control 152.99 $ Manzella Gloves Great selection 189.99 Flambeau Goose Decoys 29.99 $ Allen Upland Full Body, 2 Count DT 1810 Plus Training collar, 1 mile range Strap Adj. Game Vest 9.99 $ Remington 870 Express starting at Small Game Loads starting at Pheasant Loads 49.99 6.49 $ $ 299.99 $ Front-loading, Blaze Orange 279.99 $29.99 $ 29.99 $ Gerber Take-A-Part Game Shears 199.99 $ The Buck Boiler Deer Skull Boiler In The Field Ozone Generator Blankets your scent zone with scent destroying ozone! 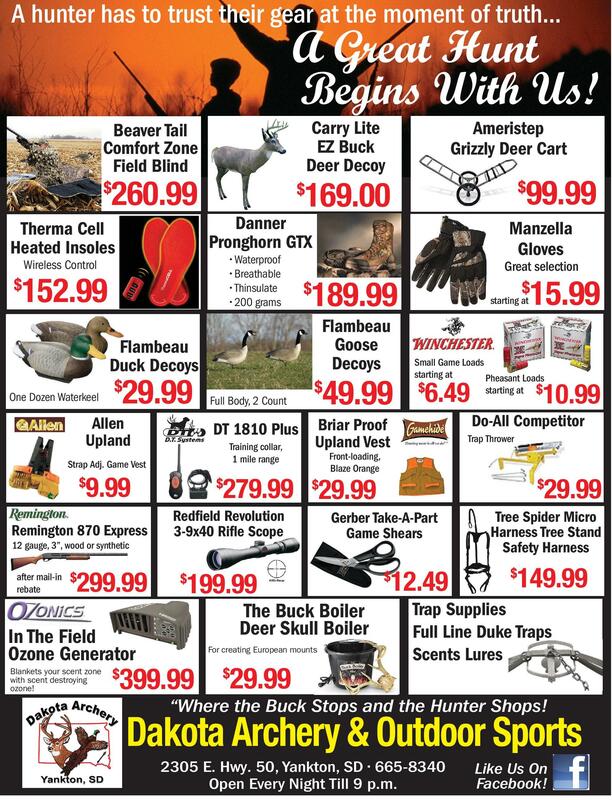 For creating European mounts 399.99 $ 10.99 $ Trap Thrower 12 gauge, 3”, wood or synthetic after mail-in rebate starting at Do-All Competitor Briar Proof Upland Vest Redfield Revolution 3-9x40 Rifle Scope 15.99 $ $ Flambeau Duck Decoys One Dozen Waterkeel Ameristep Grizzly Deer Cart 12.49 $ Tree Spider Micro Harness Tree Stand Safety Harness 149.99 $ Trap Supplies Full Line Duke Traps Scents Lures 29.99 $ “Where the Buck Stops and the Hunter Shops! Dakota Archery & Outdoor Sports 2305 E. Hwy. 50, Yankton, SD • 665-8340 Open Every Night Till 9 p.m. Like Us On Facebook!